Jane Tolerton worked as a writer for Te Ara in 2008 and 2009. She had come to the project after completing an outstanding biography of Ettie Rout, and then a collection of oral histories of First World War soldiers. 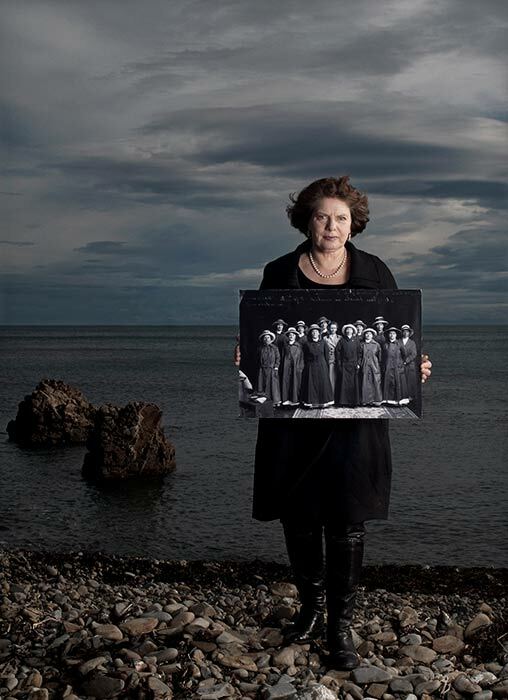 This photograph was taken as part of the New Zealand Portrait Gallery's 2014 exhibition Facing the Front: New Zealand's Enduring First World War, and shows her holding a photo of the Volunteer Sisterhood, which Rout (seen in the centre of the photo, hatless) founded in 1915 to assist with nursing wounded soldiers in Egypt. ‘In this game, you read a book a day,’ a historian friend once said to me. I never did, until I worked at Te Ara, where one had to climb a tree and root around in the undergrowth at the same time, getting an overall view of a subject and looking for the detail. You could only do it by reading a book a day. Except where there weren’t any. My first assignment was Taxis. No one had written anything. But there was the ex-head of the Taxi Federation who was still doing its website at 80-plus. So I went to see him, and with George’s overview, I had a lead on hunting out material, mainly from newspapers. What has been astounding to me since is the usefulness of what I learnt at Te Ara. Drilling down into individual topics has given me an enormous amount of information to call on. Doing a number of topics in quick succession meant covering a lot of ground. The combination means being able to make new connections, and the picture of the country’s history that emerges is more complicated, more subtle – more interesting. It’s much harder to make airy summings-up or give the obvious answer.